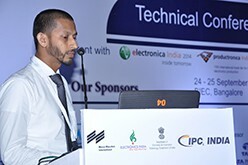 Indium Corporation’s Liyakathali Koorithodi, assistant technical manager, presented at IPC India on Sept. 24. Koorithodi’s presentation, The Second Generation Shock Resistant and Thermally-Reliable Low-Ag SAC Solder with Mn, discussed SAC0510M, a solder alloy doped with Mn, and its considerable improvement in thermal fatigue performance and shock resistance. Koorithodi has more than 13 years of experience in electronics assembly manufacturing. He has a diploma in mechanical engineering from the Department of Technical Education, Government of Kerala, and is an SMTA-certified process engineer. He earned his Six Sigma Green Belt from Motorola University. The cornerstone of IPC India is a highly selective technical conference, featuring technical paper presentations that reveal new research innovations in the electronics industry. The event highlights presentations in the fields of design, printed boards, electronics assembly, and testing, and encourages interaction with the experts who are charting the course of tomorrow’s technology. The event was co-located with Electronica India and Productronica India.